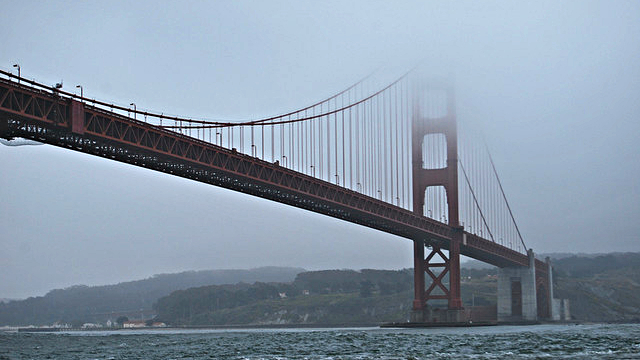 The Golden Gate Bridge, in its summer cloak of fog. Photo: kqedquest. Another foggy morning. Why is the Bay Area so foggy in summer? To answer that question, look west—at the Pacific Ocean. If you’ve ever tried to swim at the beach in Northern California, your chattering teeth will tell you that the water is cold. This cold water makes fog form. The cold water cools down the air above it, and cool air can’t hold as much moisture as warm air. The moisture condenses into fog. The water along the coast of California is cold for a couple of reasons. First, the California Current brings cold water from Alaska southward along the coast. And second, cold water from the deep ocean comes up to the surface through a process called upwelling. From March through September, wind blows southward along the coast. This wind, combined with the rotation of the earth, creates surface currents that move water from the coast out into the ocean. Something has to fill in the space that was left behind when the surface waters moved out to sea. So water from the deep ocean is sucked to the surface. The water from the deep ocean is full of nutrients. Upwelling is super important for ocean dwelling creatures—the nutrients in the water feed the phytoplankton and move on up the food web. The lush kelp forests along the California coast exist because of upwelling. And the water from the deep ocean is really cold, which makes fog form over the areas of upwelling. The fog rolls in from the ocean onto land in the morning as the rising sun heats up the land. Warm air rises, and something has to fill its place—the foggy air that’s hanging out above the ocean. So to summarize, summer winds create upwelling, fog forms over the cold water, summer sun heats the air above the land and makes it rise, and the fog gets sucked in. However, the amount of fog has declined by 33% over the past 60 years. UC Berkeley professor Todd Dawson talks about this in QUEST’s Science on the SPOT: Science of Fog. Fog is declining in part because upwelling along the coast has weakened, thanks to global warming. Warmer air temperatures are heating the surface layer of the ocean. As the surface layer gets warmer and thicker, it becomes harder for the cold deep water to mix with the warm surface layer. This weakens the upwelling. Weak upwelling means less fog is produced. Someone (though maybe not Mark Twain) once said that the coldest winter they ever spent was a summer in San Francisco. That San Francisco summer was cold because of the fog. Which brings to mind another (potential) Twain quote: “Everybody talks about the weather, but nobody does anything about it.” San Francisco is getting less and less foggy, thanks to global warming, and so far we aren’t really doing anything about it. This is the clearest explanation I have read of how fog forms in the Bay area and why, it is more complex and more involved than I thought. Thank you.